Taksim Square: Click on markers to explore the centerpoint of Istanbul's protests. (CNN) -- It's a congested, sprawling transport hub surrounded by 1950s architecture and predominantly used by commuters or tourists to cross the city of Istanbul. 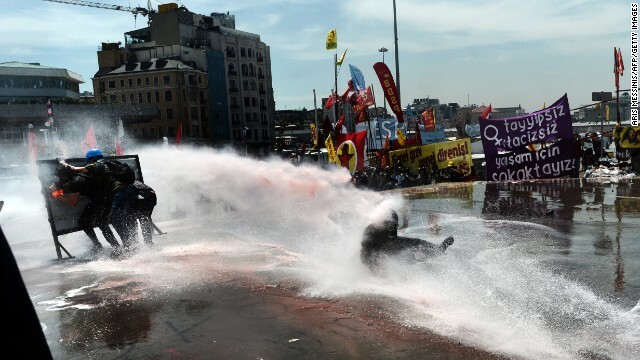 But proposed changes to Taksim Square have seen it become the flashpoint for protests that have swept through Turkey in the past week, leaving thousands injured and focusing the world's attention on the government of Prime Minister Recep Tayyip Erdogan. Taksim has been no stranger to violence. In 1977, at least 34 protesters died during May Day clashes with police. May 1 rallies in the square were banned in 1980 and were only allowed to legally resume in 2010. 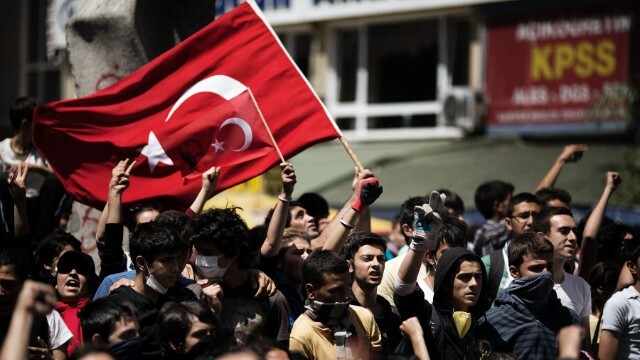 On May Day this year, there were riots after city authorities again refused to grant trade unions and youth groups permission to demonstrate in Taksim, blaming construction work being carried out in the square. Professor Ersin Kalaycioglu, professor of political science at Istanbul's Sabanci University, said significantly, Taksim Square was also known as "republic square," because it was built by the Republic of Turkey's founding fathers to commemorate the war of liberation. "Taksim Square is connected to Istiklal Caddesi -- Independence Avenue -- and Cumhuriyet Caddesi -- the Avenue of the Republic. So there is a lot of symbolism that has to do with the Turkish Republic," he said. The Turkish word "taksim" translates as "divide" and Kalaycioglu said Taksim Square was so-named because the area used to be the site of Istanbul's main reservoir, where the water was divided up. Turkish Prime Minister Recep Tayyip Erdogan speaks to the deputies of his ruling Justice and Development Party during a meeting with Turkish parliament on Tuesday, June 18. 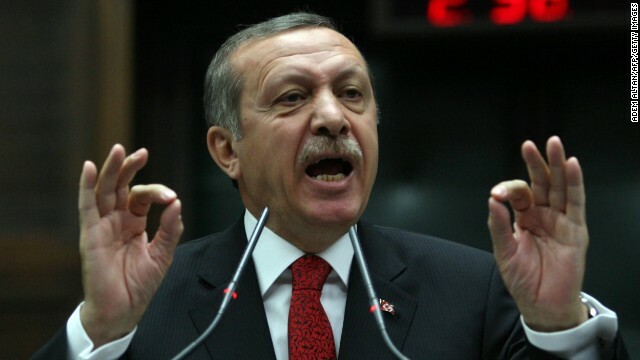 Erdogan said he had no intention of restricting anyone's democratic rights. "If you want to make a protest do it, do it, but do it within the framework of law," he said. 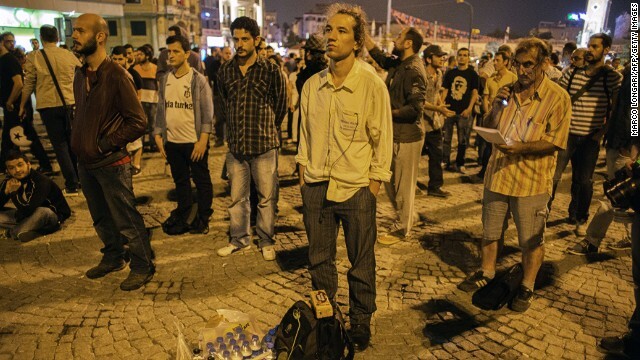 Turkish performance artist Erdem Gunduz, center, is joined by others as he makes his silent protest in Taksim Square. As word of his gesture of protest spread, Gunduz became known as the "standing man." Protests that began as a demonstration against the planned demolition of a park have grown into general anti-government dissent across the nation. 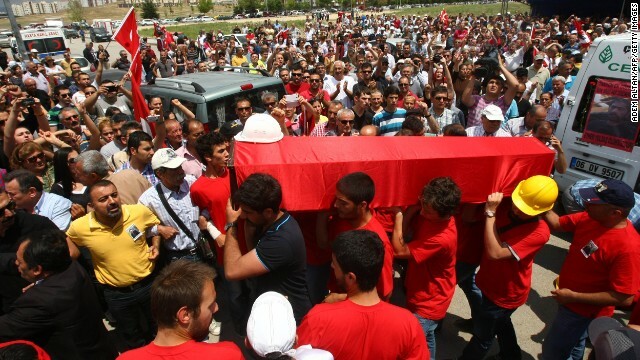 People carry the coffin of Ethem Sarisuluk, who was killed during recent protests in Turkey, on Sunday, June 16, in Ankara. 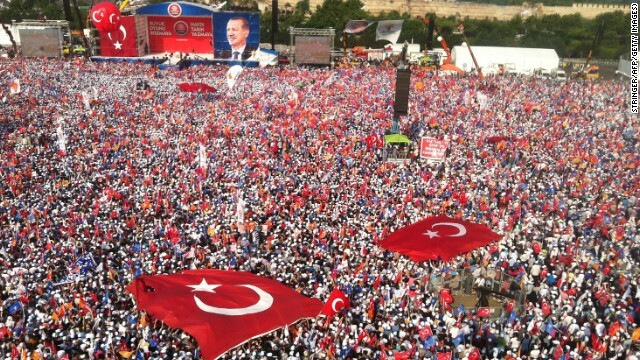 Tens of thousands attend a rally to hear Turkish Prime Minister Recep Tayyip Erdogan speak in Istanbul on June 16, a day after he ordered a crackdown on anti-government protesters at Gezi Park. 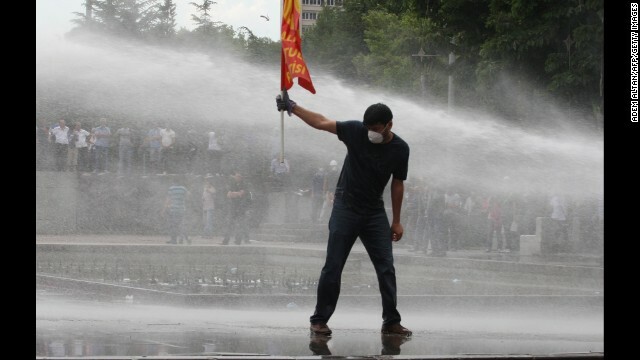 A protester faces water cannons during a clash with police at an anti-government demonstration in Ankara on June 16. 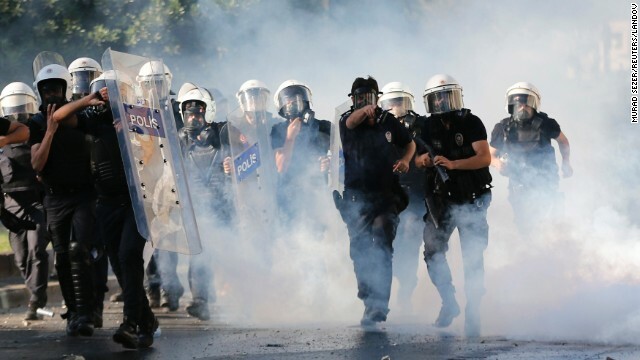 Police walk through tear gas during protests at Kizilay Square in central Ankara on June 16. 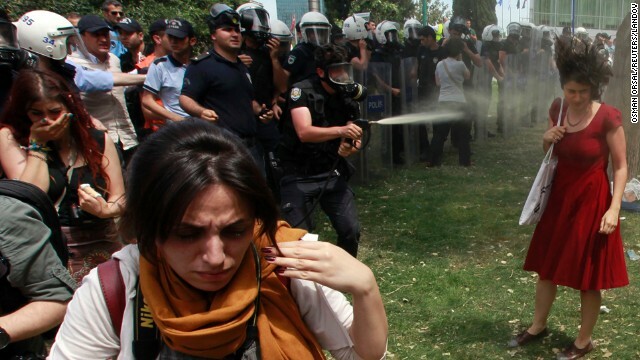 Police detain protesters after a crackdown on a demonstration at Istanbul's Gezi Park on June 16. A protester runs during clashes between riot police and demonstrators in the streets adjacent to Taksim Square in Istanbul on Sunday, June 16. 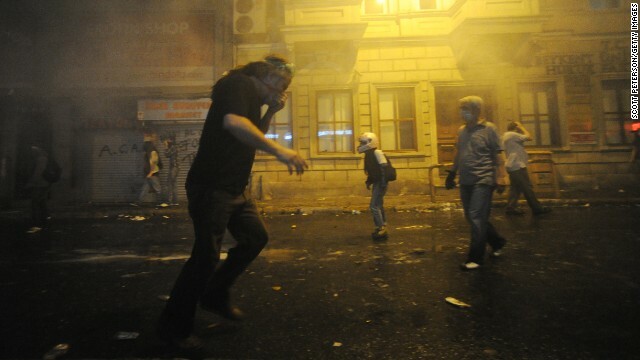 A protester throws a tear gas canister back at riot police during clashes near Taksim Square on June 16. 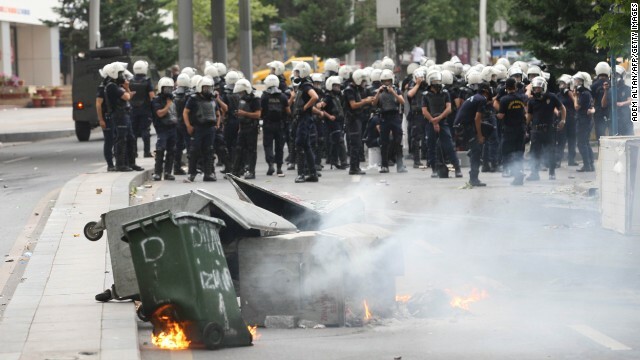 Trash containers burn in front of riot police forces in Ankara, Turkey, on June 16. 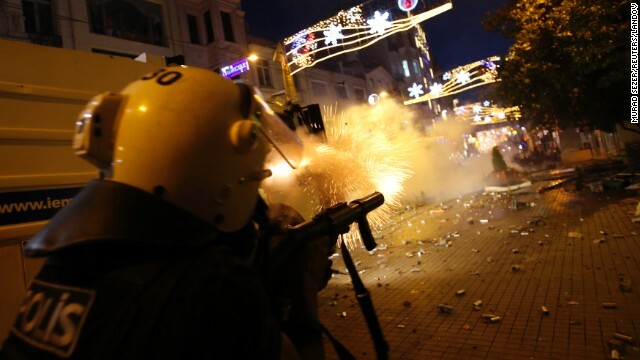 Protesters gather in the main shopping street near Taksim Square in the early morning hours of June 16 as riot police clear Gezi Park in Istanbul. Turkish riot police officers use rubber bullets on June 15 to disperse demonstrators in Gezi Park in Istanbul on June 15. Protesters scramble for safety as Turkish riot police officers push them out of Gezi Park using tear gas and rubber bullets. Protesters run for cover as riot police spray them with a water cannon on June 15. 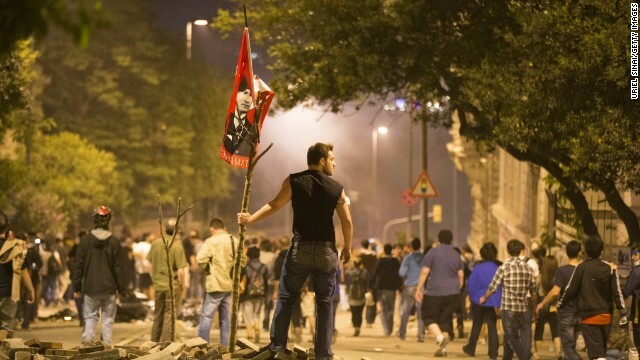 A protester throws rocks at police during clashes at the entrance of Gezi Park on June 15. A protester on June 15, reacts in pain to a salvo of tear gas fired by Turkish riot police chasing out demonstrators in order to dismantle their tent camp in Gezi Park in Istanbul. Riot police move in a line through the tent camp on June 15. 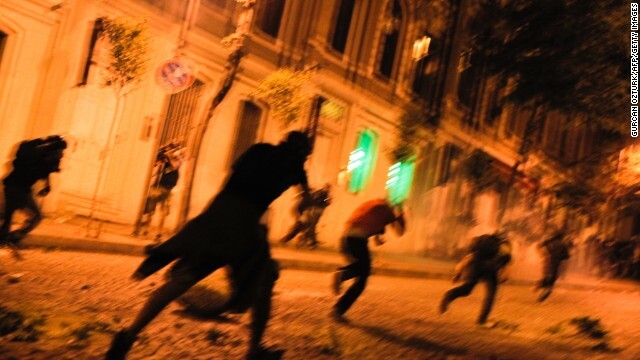 Protesters escape from tear gas during the crackdown at Gezi Park on June 15. 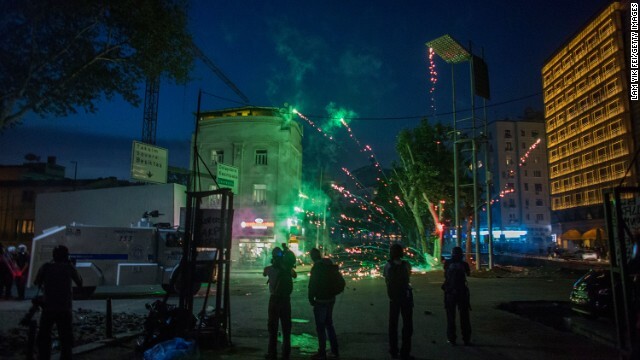 Protestors fire fireworks as police drive them out of Gezi Park on June 15. 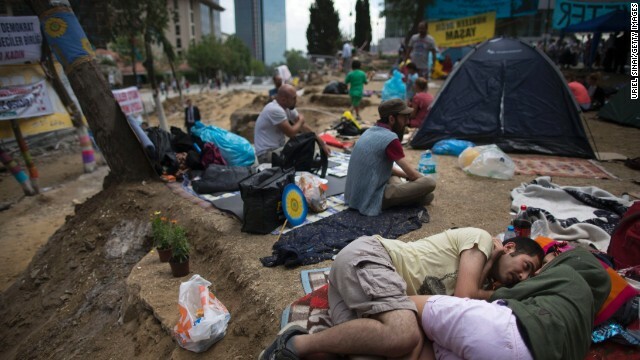 Protesters sleep in Gezi Park in Istanbul's Taksim Square early Thursday, June 13. 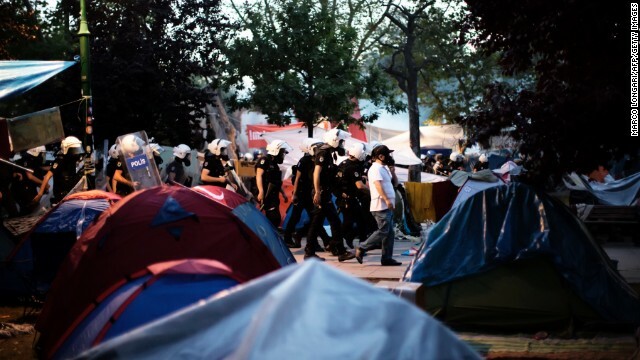 Turkey's prime minister on Thursday called on protesters camped out in the park to pack up and leave. 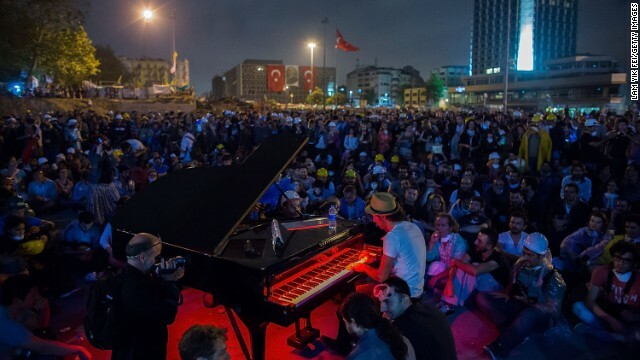 A man plays piano for hundreds of protesters in Taksim Square on Wednesday, June 12, in Istanbul. 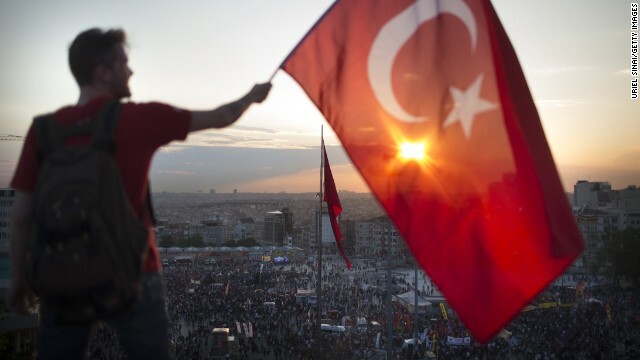 A man waves a flag in Taksim Square on June 12. 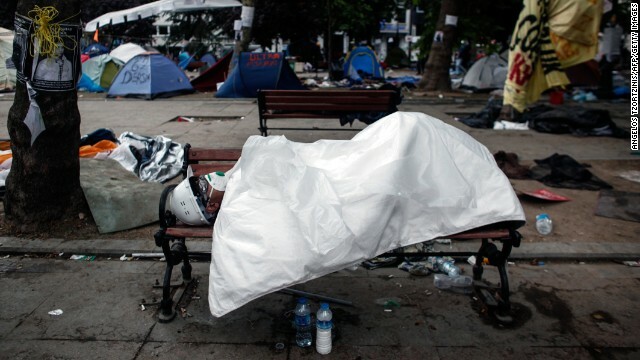 A man sleeps in Gezi Park in Istanbul's Taksim Square early on June 12, hours after riot police moved into the square in an attempt to push demonstrators out. 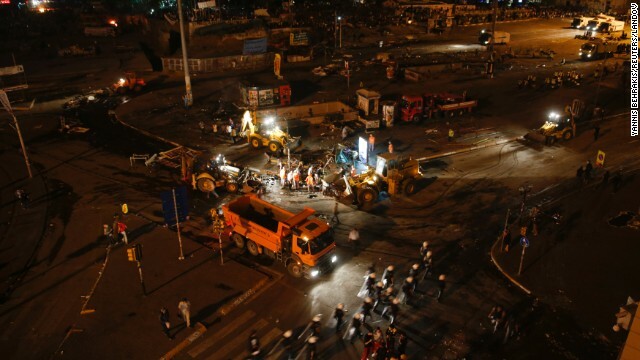 Municipal workers clean up a street in Taksim Square early on June 12, after police moved in to disperse protesters. 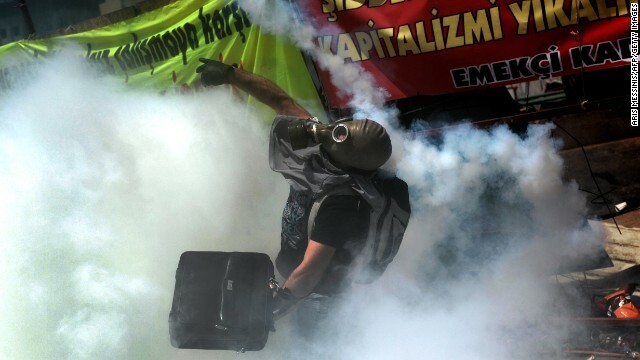 A protester prepares to throw a tear gas canister back toward police in Taksim Square on Tuesday, June 11. 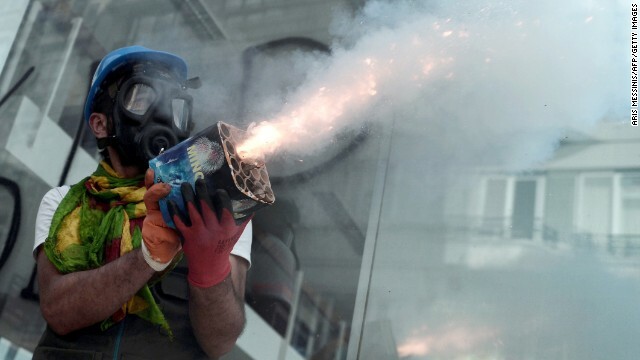 Riot police fire tear gas canisters at protesters in Taksim Square on June 11. 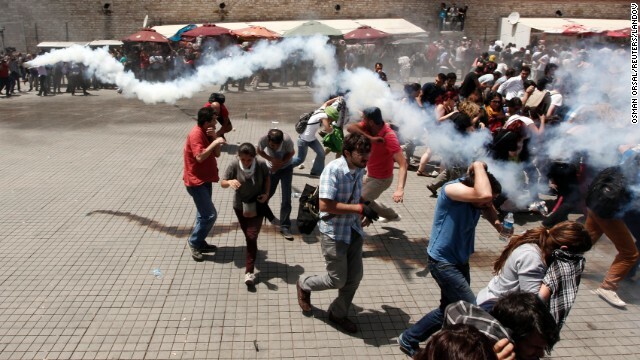 People run from a tear gas cloud in Taksim Square on June 11. 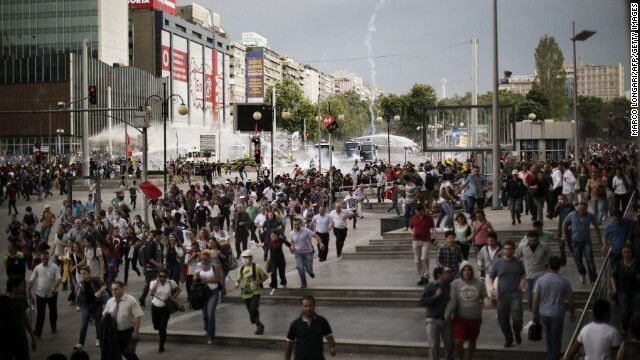 People flee as riot police fire tear gas on Taksim Square on June 11. Protesters run behind a barricade during clashes with police on June 11. 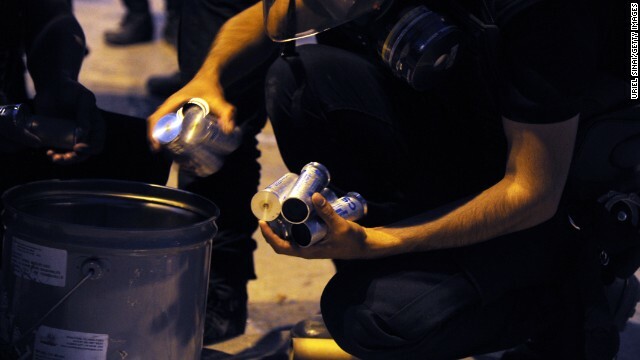 A protester throws a tear gas canister back toward police on June 11. Photographers crowd around a protester posing in front of a riot police vehicle at Taksim Square on June 11. Protesters seek shelter behind a barricade on June 11. Protesters try to run from riot police on June 11. 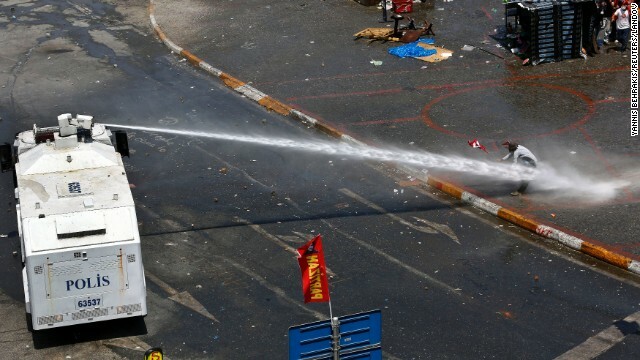 Riot police aim a water cannon at a protester as others take cover behind a makeshift shelter in Taksim Square on June 11. 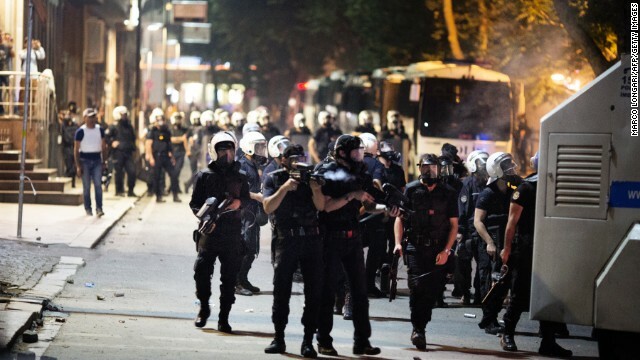 Police enter Taksim Square during clashes with protesters on June 11. 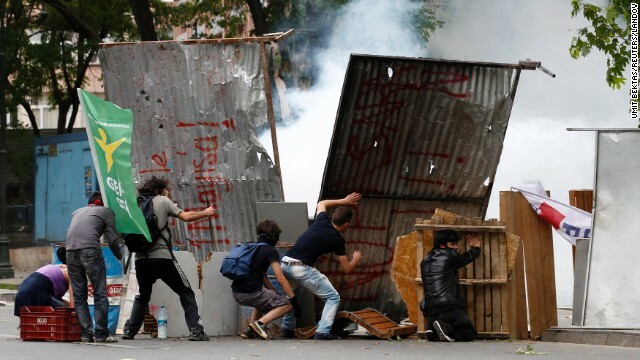 Protesters take cover behind a barricade in Gezi Park in Istanbul on June 11. 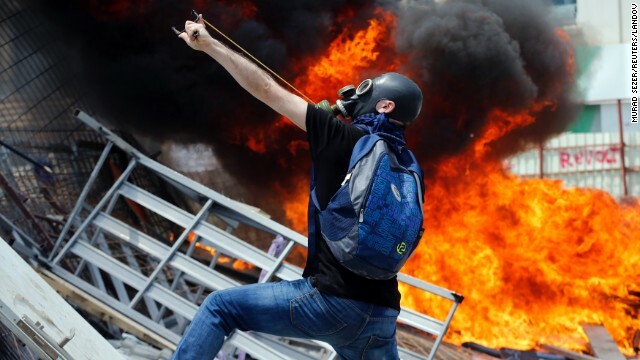 A protester uses a slingshot to throw stones at riot police on June 11. 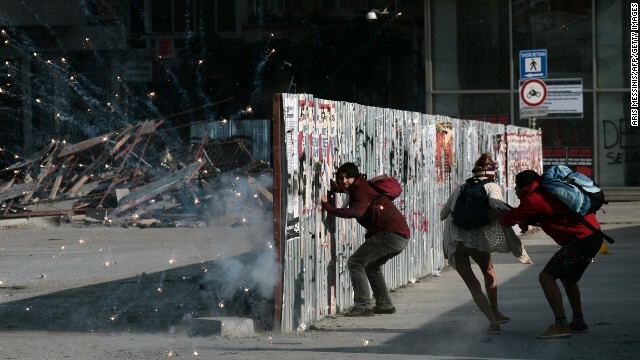 Protesters take cover behind a barricade in Taksim Square on June 11. 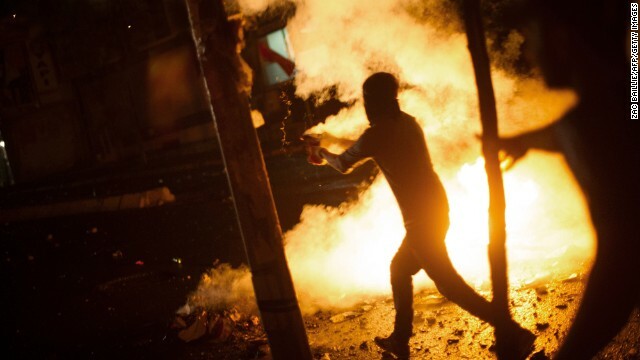 A protester holds fireworks during clashes with riot police in Istabul on June 11. 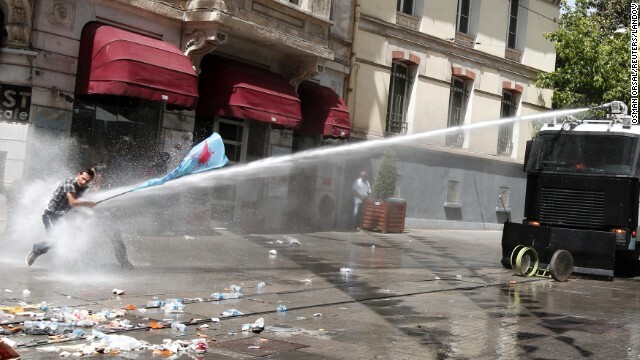 Riot police use water cannons and tear gas to disperse a crowd near Istabul's Taksim Square on June 11. 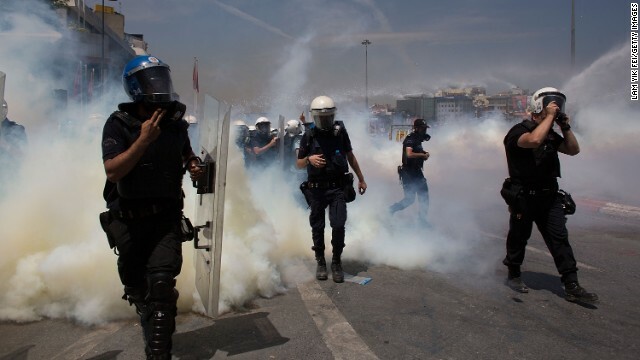 Riot police fire tear gas at demonstrators in Taksim Square on June 11. Police fire a water cannon at protesters on June 11. Protesters hold molotov cocktails in Taksim Square on June 11. 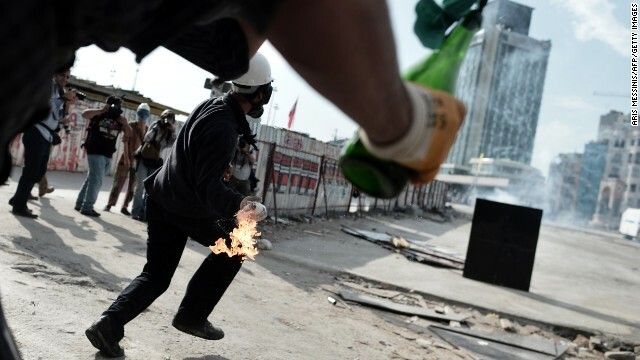 A protester throws a stone during clashes with riot police on June 11. 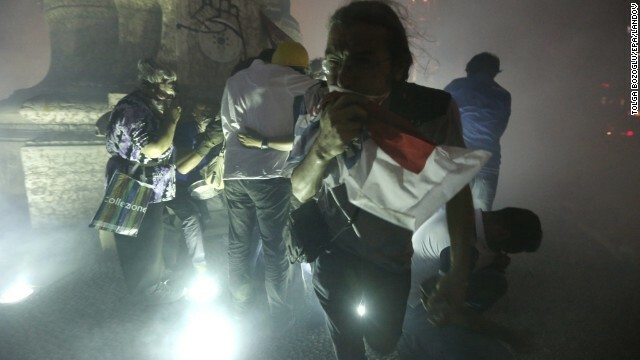 Protesters run from smoke as they clash with police in Istanbul on June 11. Protesters take cover behind a barricade as fireworks go off nearby on June 11. 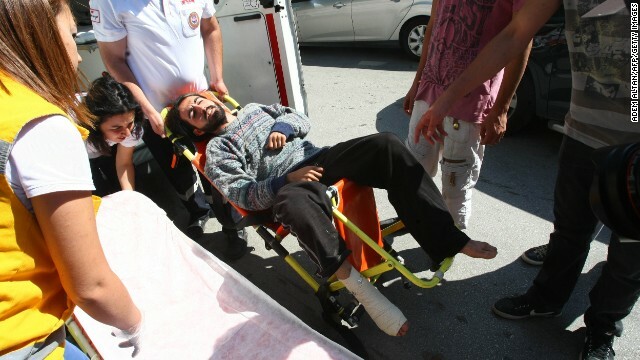 Medics carry Yasin Ayhan, 23, a protester who broke his leg in a raid early Monday, June 10, in Kugulu Park. 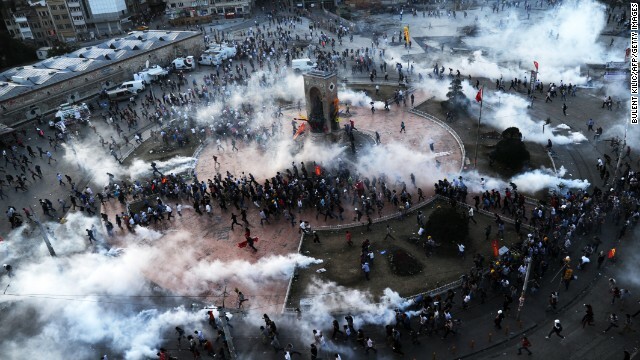 Riot police doused thousands of protesters in Ankara with tear gas and jets of water for a second straight night. 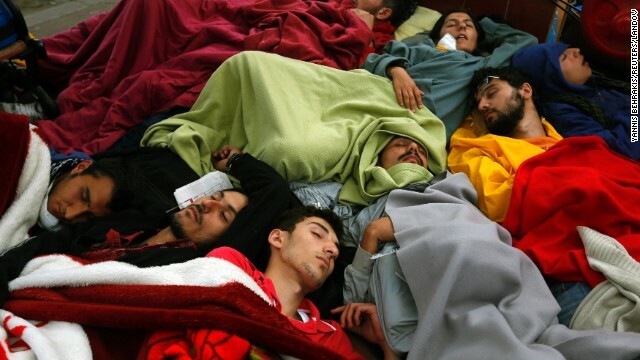 Protesters sleep at Taksim Square in central Istanbul on June 10. Prime Minister Recep Tayyip Erdogan warned protesters who have taken to the streets demanding his resignation that his patience has its limits and compared the unrest with an army attempt six years ago to curb his power. 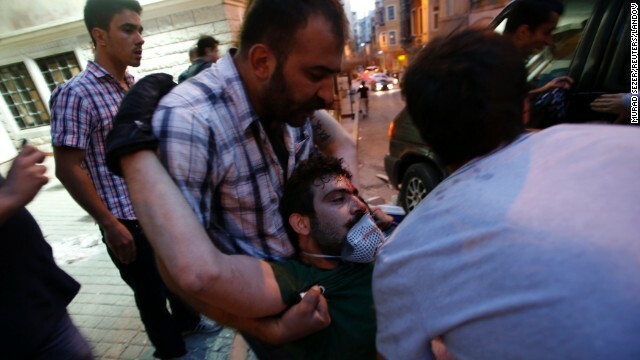 A demonstrator is detained by police officers as protests resumed in Kizilay Square in Ankara on Sunday, June 9. 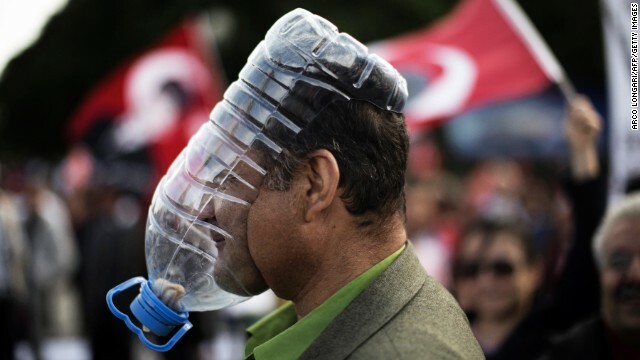 A demonstrator covers his face with a makeshift gas mask during protests in Kizilay Square in Ankara on June 9. Turkish Prime Minister Recep Tayyip Erdogan, left, and his wife, Emine, wave to supporters upon their arrival in Ankara on June 9. Erdogan told supporters that "even patience has an end" as he went on the offensive against mass protests that have consumed Ankara and Istanbul. 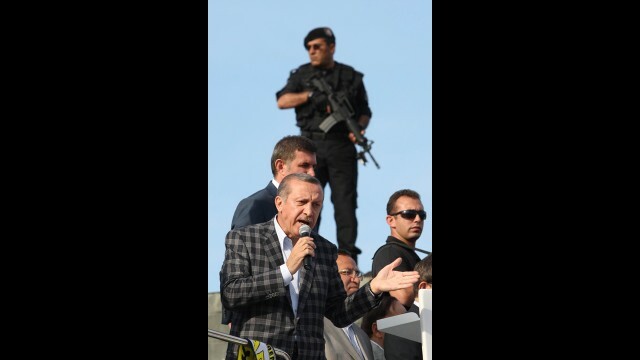 Erdogan addresses supporters from the top of a bus as police stand guard at Esenboga International Airport in Ankara on June 9. 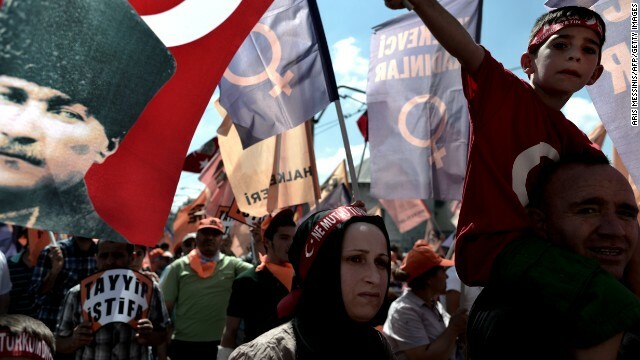 Protesters gather during a demonstration at Taksim Square in Istanbul, on June 9. A demonstrator runs toward police during clashes with riot police in Istanbul, on Saturday, June 8. 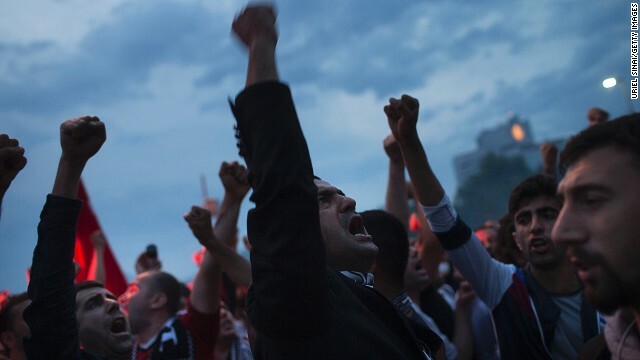 Demonstrators shout slogans as they gather at Kizilay Square in Ankara, Turkey, on June 8. 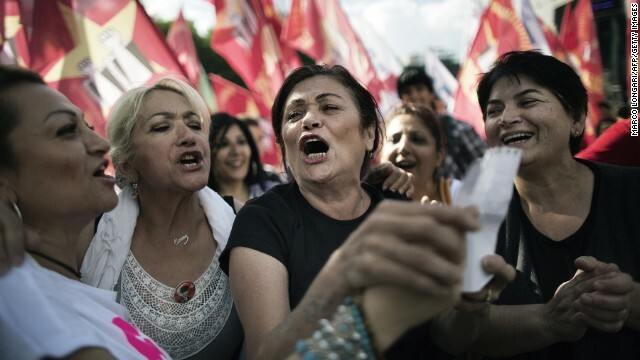 Women sing as people gather at Kizilay Square in Ankara on June 8. 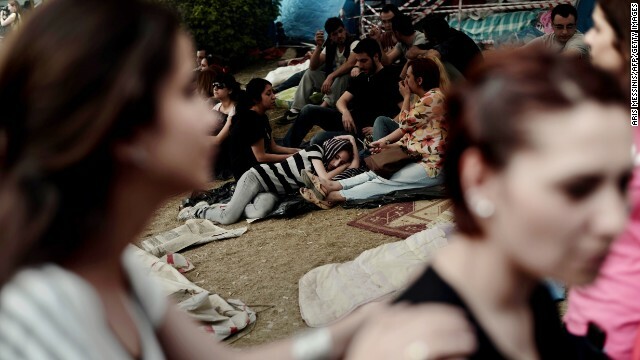 Protesters rest in Gezi Park next to Taksim Square during a demonstration in Istanbul on Friday, June 7. Prime Minister Recep Tayyip Erdogan speaks during the opening session of the Ministry for European Union Affairs Conference on June 7 in Istanbul. 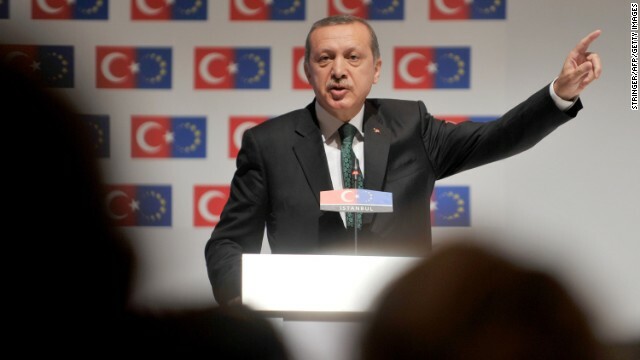 Erdogan said today his Islamic-rooted government was open to "democratic demands" and hit back at EU criticism of his government's handling of a week of unrest. Supporters of Erdogan wave the Turkish flag upon the prime minister's arrival in Istanbul, on June 7. 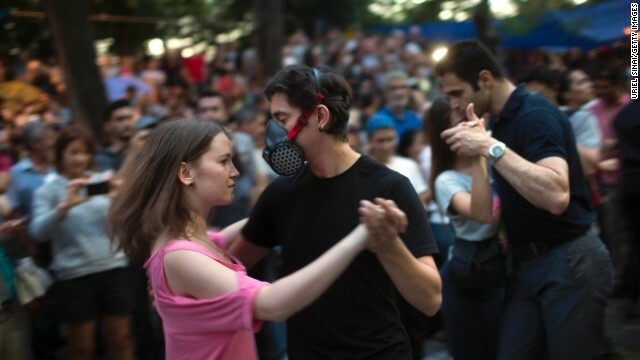 Protestors dance at Gezi Park in Taksim Square on Thursday, June 6. 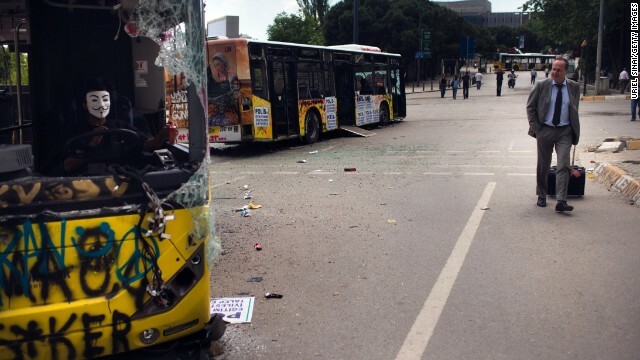 A man walks past damaged buses near Taksim Square on Thursday, June 6, in Istanbul, Turkey. 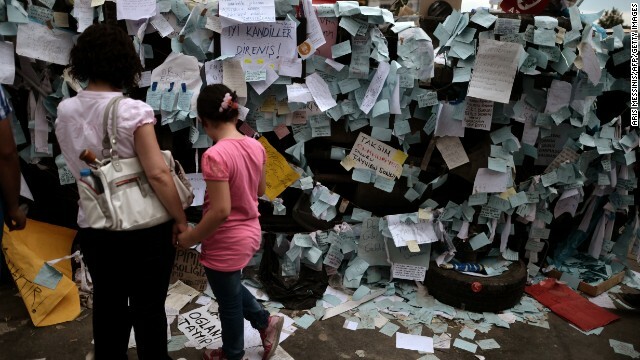 A mother and her daughter read notes placed by protestors on a destroyed car in Taksim Square on June 6. 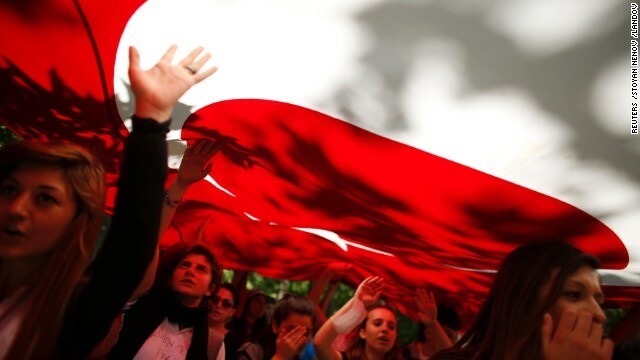 Thousands of striking union members joined the anti-government protests on June 5, marching in Istanbul and Ankara in a sea of red and white union flags, drumming and yelling for Prime Minister Recep Tayyip Erdogan to resign. 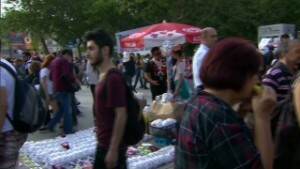 Protestors spend their day at Gezi Park on June 6. Protestors demonstrate near the office building of Turkish Prime Minister Recep Tayyip Erdogan in Istanbul early on June 6. 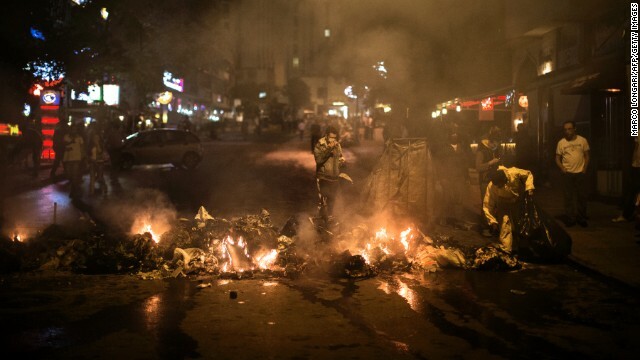 A municipal worker collects garbage set on fire by Turkish protesters in a restaurant district of Ankara on June 5. 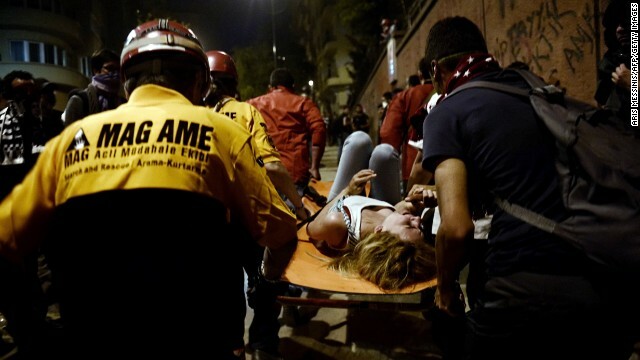 A woman is wheeled away by paramedics during clashes on Kizilay Square in Ankara on Wednesday, June 5. 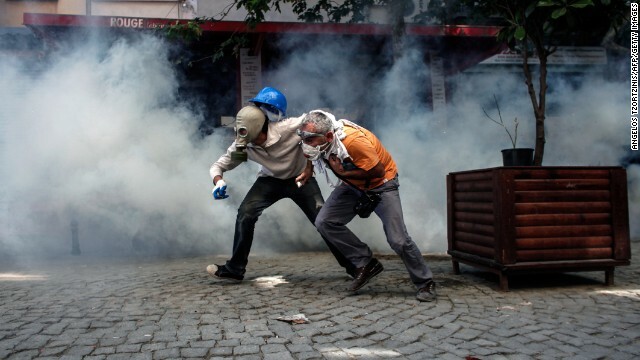 Protesters confront police forces during riots in a restaurant district of Ankara, on June 5. 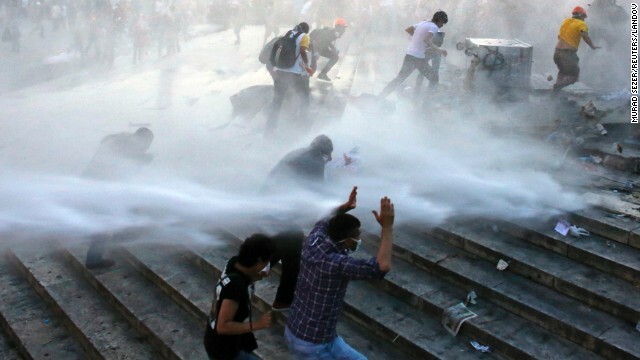 Demonstrators run for cover as police use water cannons and tear gas on the crowd in Ankara on June 5. 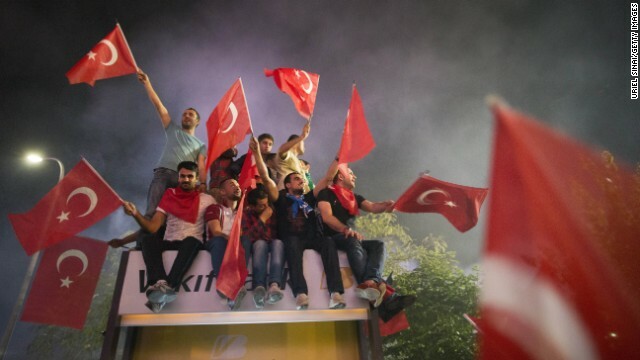 Protesters gather in Taksim Square as they shout slogans while protesting on Tuesday, June 4, in Istanbul, Turkey. 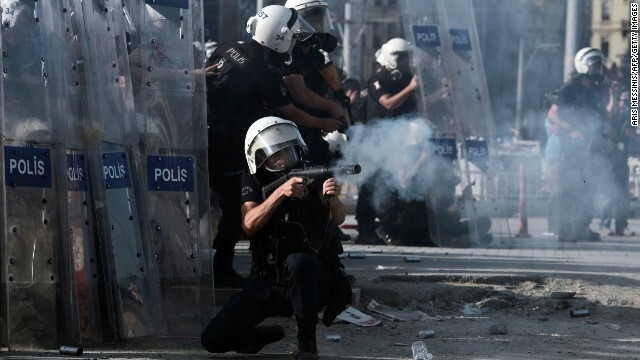 Riot police fire tear gas at demonstrators in Istanbul on June 4. Paramedics carry a woman injured during clashes between demonstrators and riot police in Istanbul on June 4. Turkish police detain a demonstrator during clashes in Istanbul on June 4. A protester looks on during clashes with Turkish police outside of Prime Minister Recep Tayyip Erdogan's office, near Taksim Square in Istanbul on Tuesday, June 4. Demonstrators wave their national flag on June 4, during a protest in Ankara. 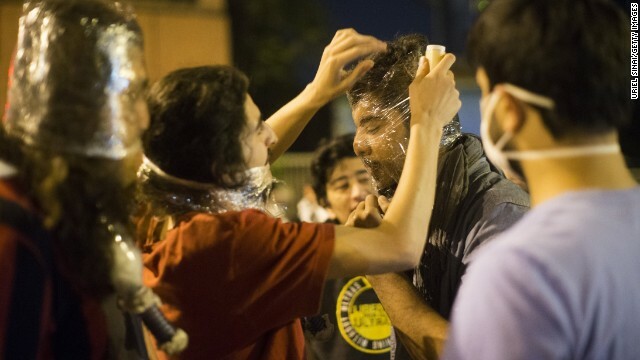 Protesters cover their faces with plastic. 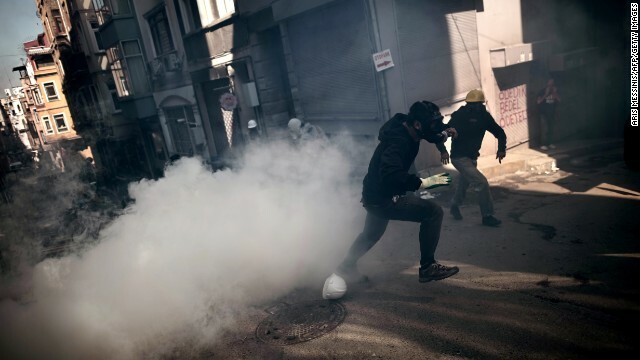 After chaotic scenes in the streets Monday that continued late into the night and sent tear gas wafting through the air, the situation was relatively calm on Tuesday morning in Istanbul's central Taksim Square, near the park where the movement began. A demonstrator takes cover at a road block between Taksim and Besiktas in Istanbul on June 4. 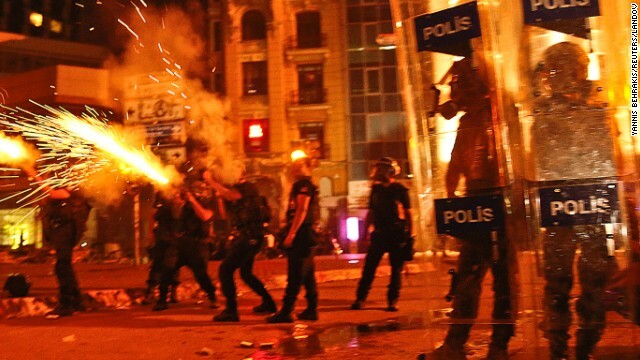 Protesters clash with riot police between Taksim and Besiktas in Istanbul on Monday, June 3. 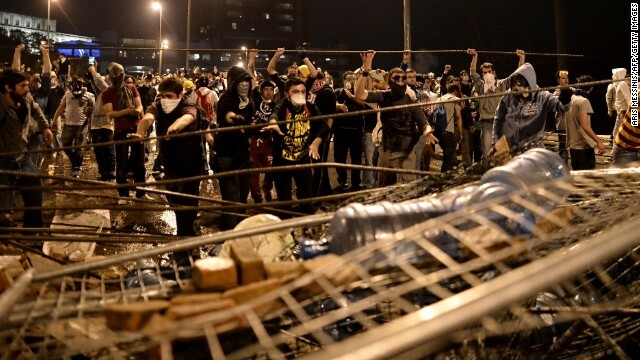 Protestors pass bricks for building barricades during clashes with riot police in Istanbul on June 3. 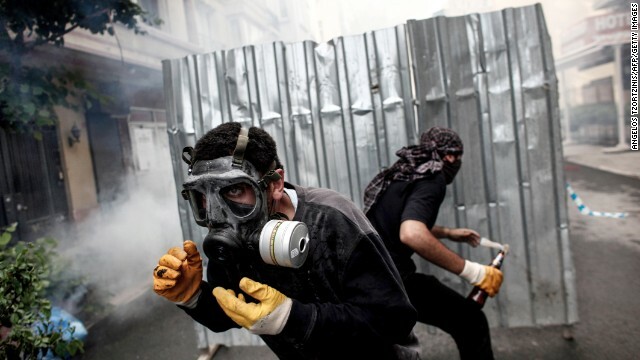 Riot policemen unload tear gas during clashes in Istanbul on June 3. 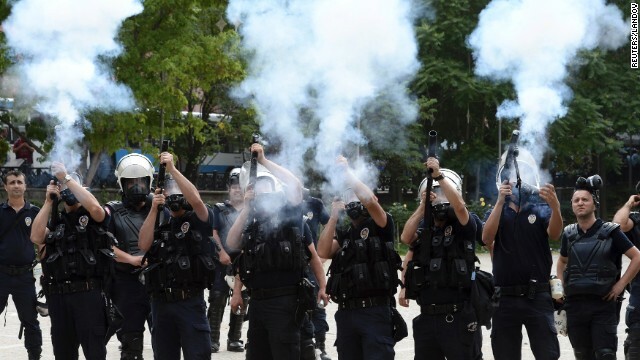 Protesters throw riot police's tear gas back at them in Istanbul on June 3. Protester wounds are treated during clashes in Istanbul on June 3. Demonstrators set up road blocks between Taksim and Besiktas. 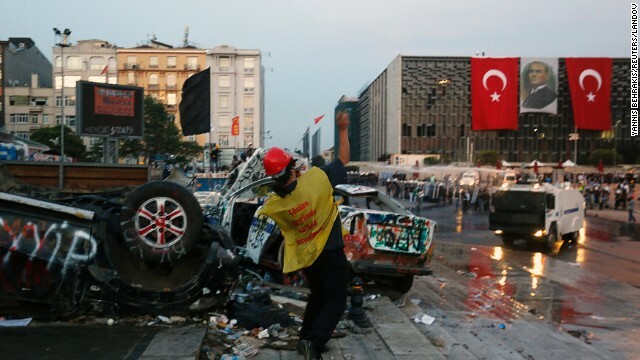 Barricades remain up around the square, and Erdogan's opponents appear determined to continue the demonstrations despite the prime minister's comment on June 3 that he expects the situation to return to normal "within a few days." 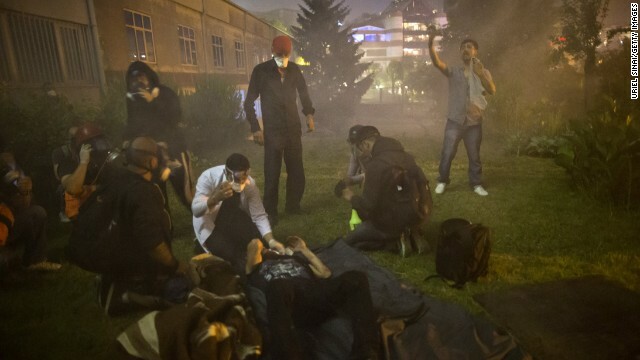 A medical team tends to a protester. 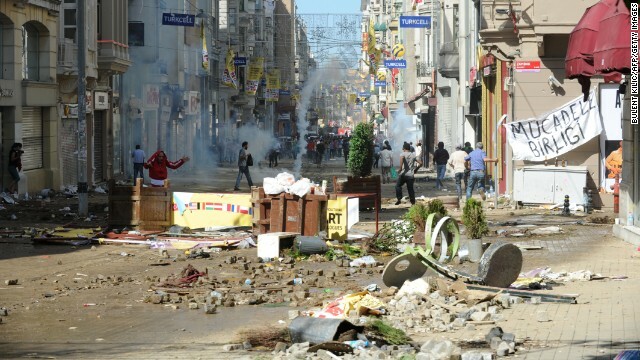 The Turkish Medical Association claimed that at least 3,195 people had been injured in clashes on June 1 and June 2. Only 26 of them were in serious or critical condition, it said. 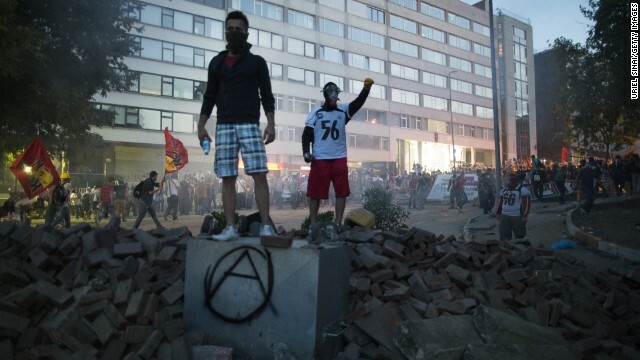 Protesters stand atop a pile of rubble during clashes with Turkish police on Monday, June 3. 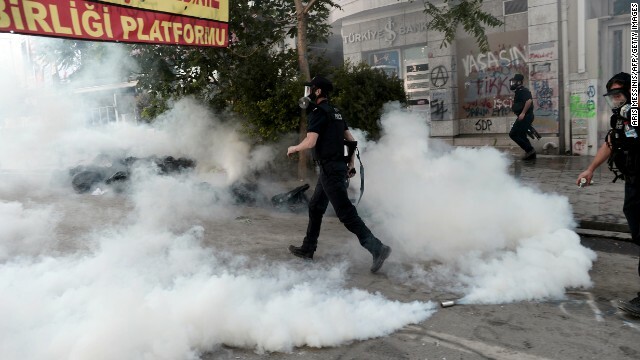 Turkish riot police fire tear gas canisters to disperse protesters near Taksim Square on June 3. 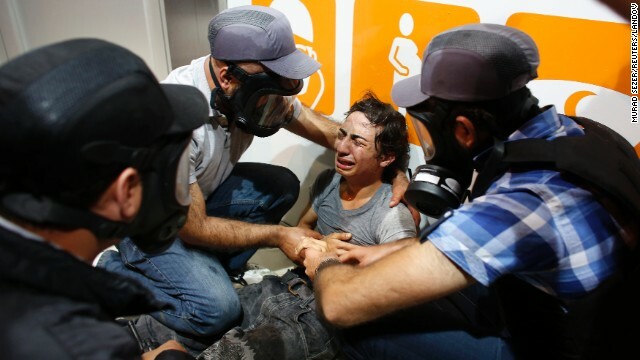 Police officers tend to a demonstrator during the violent clashes in Istanbul on June 3. A protester waves the Turkish flag from a rooftop at Taksim Square on June 3 as large crowds continue to demonstrate below. 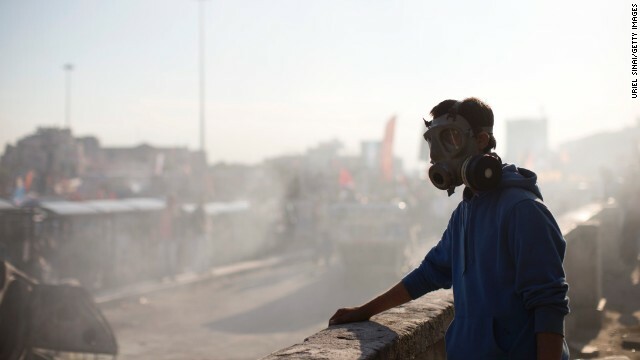 A protester wears a gas mask as smoke from a burned car fills the air at Taksim Square on June 3. 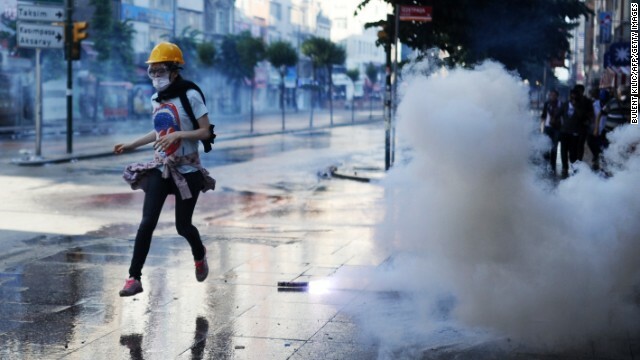 Despite Turkish Prime Minister Recep Tayyip Erdogan's call for calm on Monday, June 3, protests continued in Istanbul. 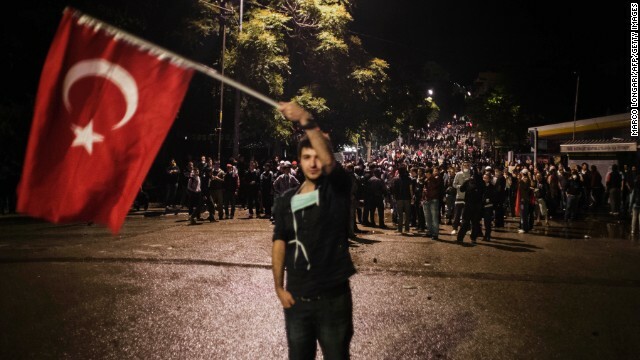 Protesters carry the Turkish flag and shout against the government in Gezi Park near central Istanbul. After protests that lasted until the early morning, a protester sleeps in a damaged and vandalized vehicle in Taksim Square on June 3. 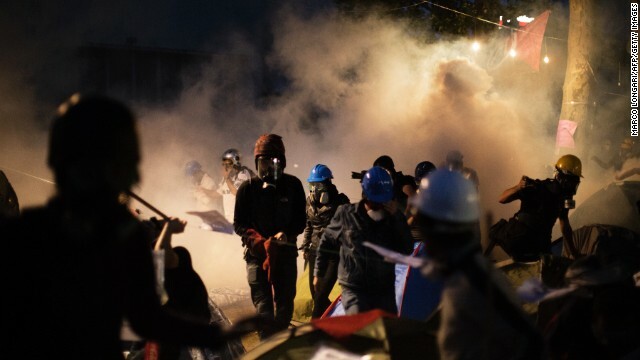 Protests showed no sign of letting up on Monday, almost a week after a peaceful sit-in was met with a police crackdown, igniting the biggest anti-government riots the city has seen in a decade. 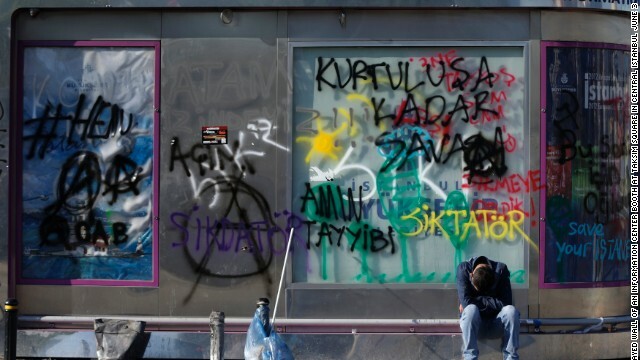 A tired protester rests in front of the graffiti-sprayed wall of an information booth at Taksim Square in central Istanbul on June 3. 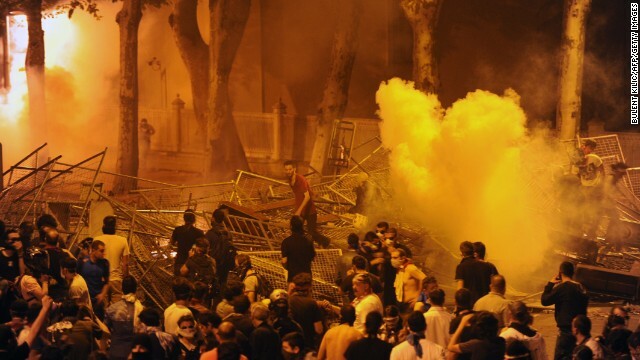 Turkish protesters clash with riot police near the prime minister's office between Taksim and Besiktas early June 3. 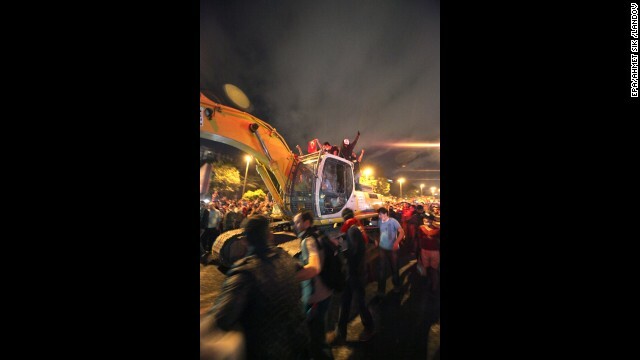 Protesters drive an excavator toward Turkish riot police as they make their way to Erdogan's office on June 3. 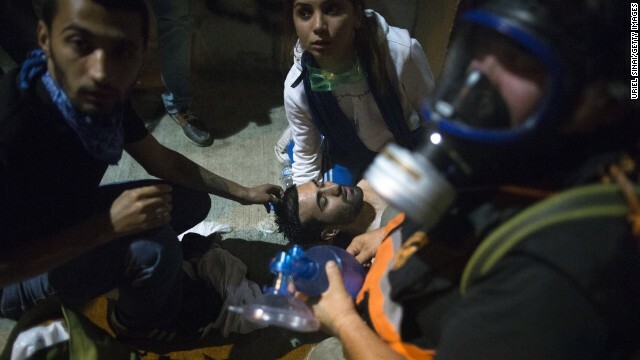 During the clashes, volunteer doctors helped injured protesters in a mosque on June 3. A protester is silhouetted by a burning car at Taksim Square during clashes in the early morning of June 3. 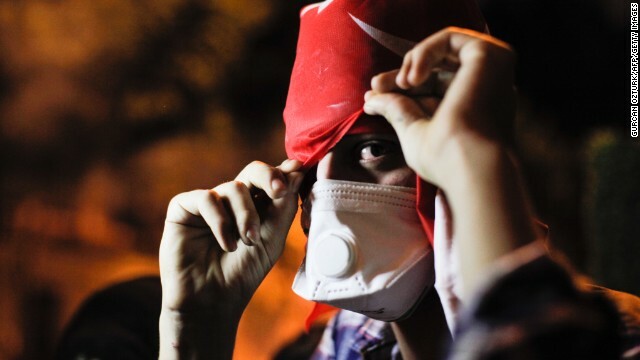 A protester covers his face on June 3 near Erdogan's office in Istanbul. 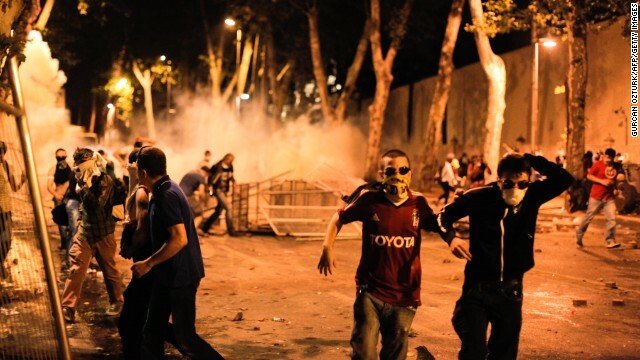 Protesters clash with riot police in Istanbul on June 3. Riot police fire tear gas during a protest against Turkey's Prime Minister Recep Tayyip Erdogan and his ruling AK Party in central Ankara on June 2. 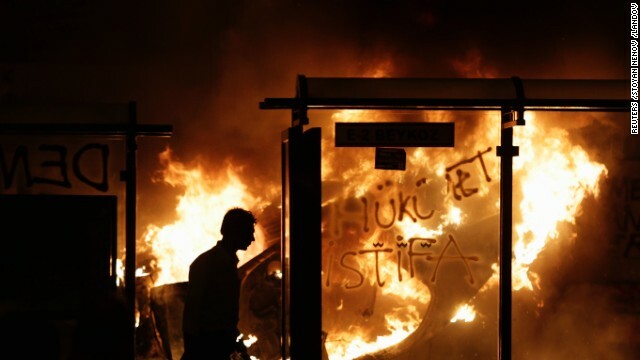 Sparked by the events in Istanbul, general anti-government protests have sprung up in Ankara. Demonstrators hide behind makeshift shields during clashes with Turkish riot police in Ankara on June 2. Police use a water cannon to disperse protesters outside Turkish Prime Minister Recep Tayyip Erdogan's working office in Istanbul on June 2. 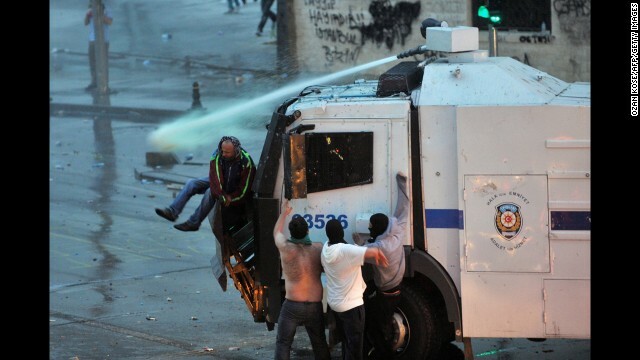 Protesters cling to a police vehicle mounted with a water canon in Istanbul on June 2. Turkish police detain a protester during demonstrations in Ankara on June 2. 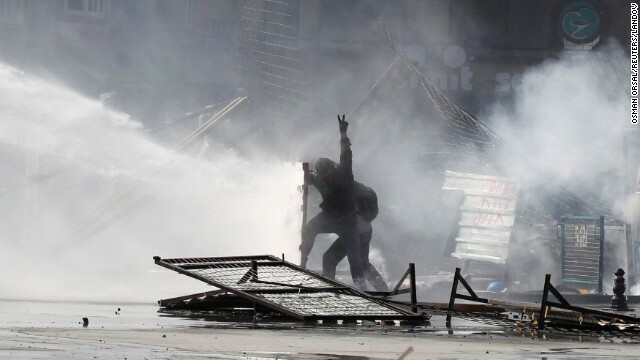 A protester flashes a victory sign as he takes part in a demonstration in Ankara on Saturday, June 1 in support of the protests in Istanbul against government plans to demolish a park. 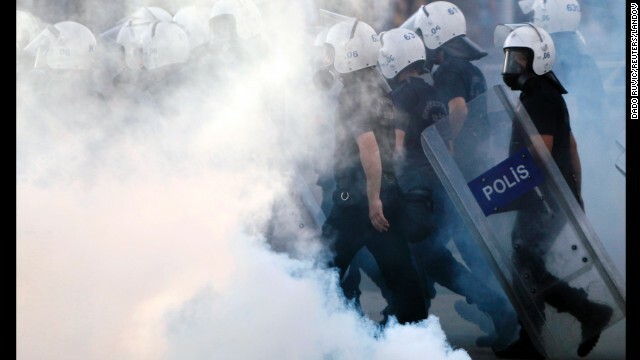 Protesters clash with riot police in Istanbul, Turkey, on Saturday, June 1. 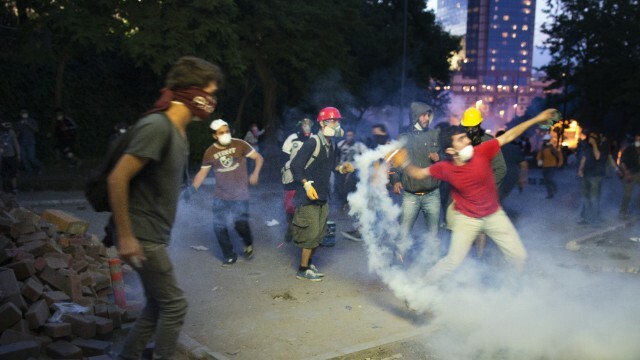 Protesters clash with riot police near Gezi Park on June 1. 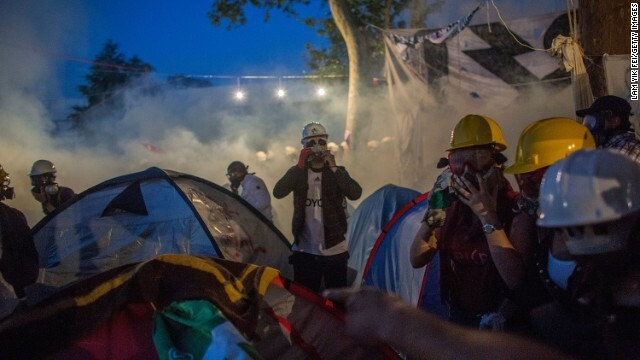 Earlier this week, several dozen activists tried to stage a sit-in at the park, the last bit of green space left in Istanbul's Taksim Square, the city's transit and commercial hub. 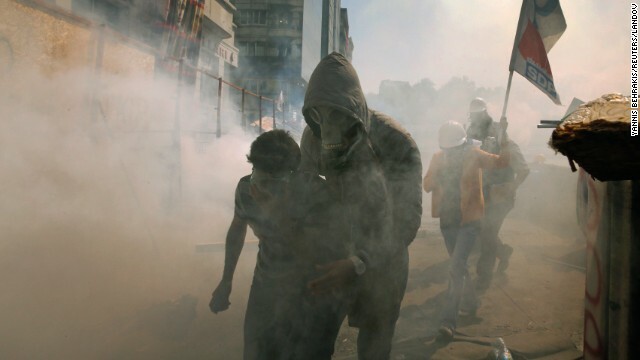 Turkish protesters wearing gas masks face off against riot police near Istanbul's Taksim Square on June 1. 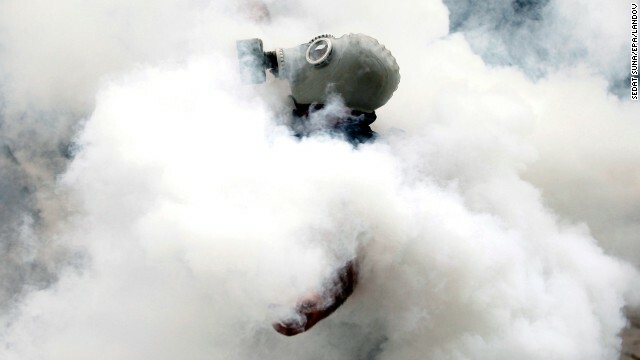 Riot police use tear gas in an attempt to disperse the crowd of demonstrators on June 1. 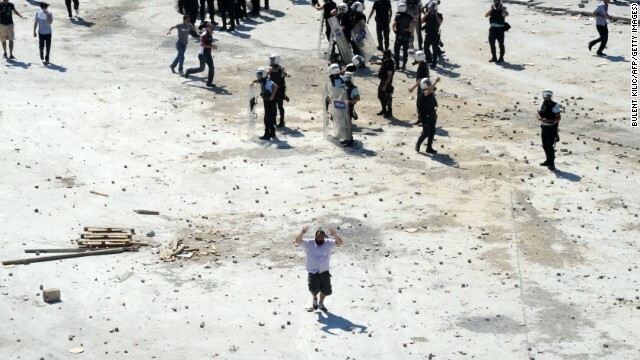 A man flees the clashes between Turkish protestors and riot police on June 1. 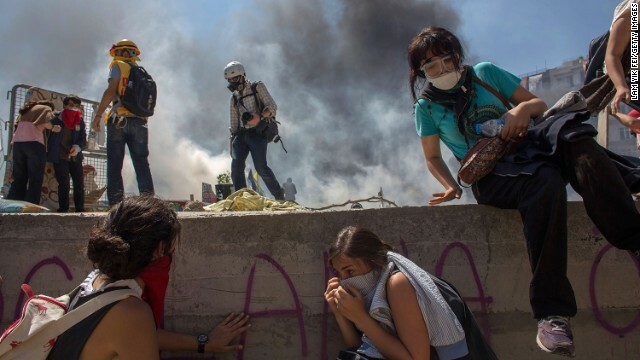 On Friday, May 31, riot police stormed the growing camp in Gezi Park with water cannons and tear gas, pushing protesters into surrounding streets and triggering the clashes that have continued for more than 24 hours. 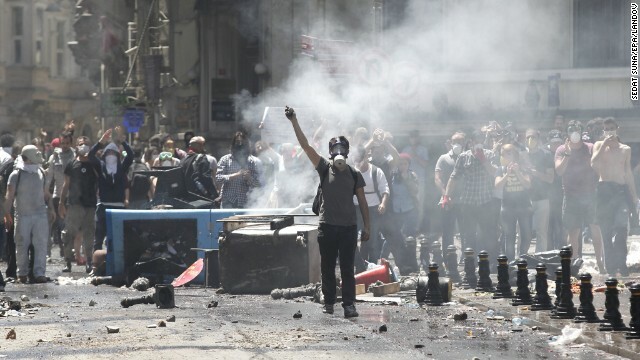 The clashes damaged surrounding businesses in Istanbul and forced them to close on June 1. 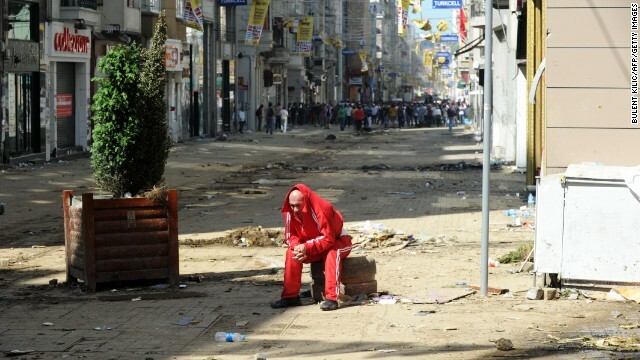 A man catches his breath behind the line where clashes are taking place on June 1. A pair of tourists gasp for air as riot police use tear gas and water cannons the fend off the demonstrators. 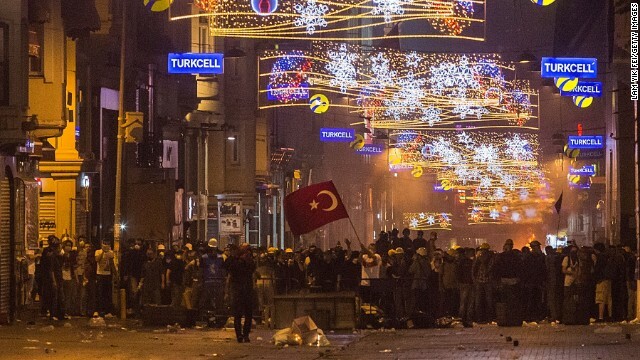 Turkish security forces allowed small groups of pedestrians to travel through the square. 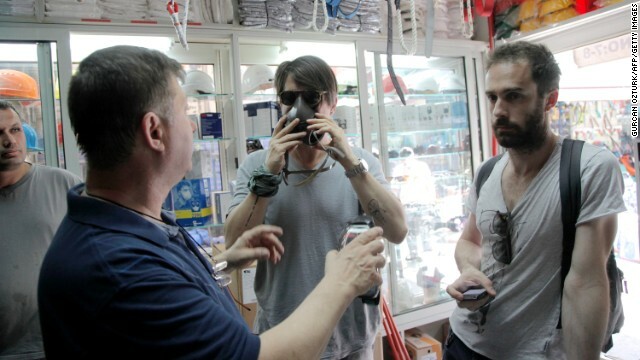 Protesters buy gas masks from a local shop near the square on June 1. 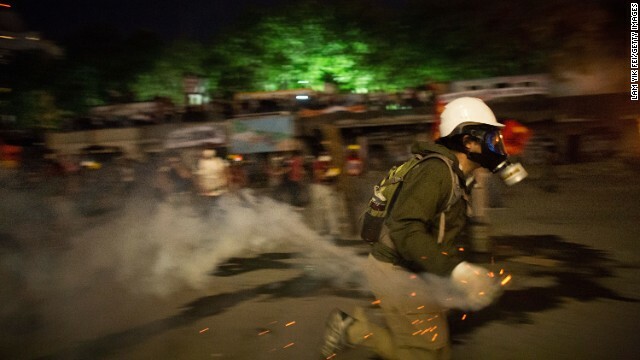 Riot police fire tear gas into the crowd of protesters overnight on Friday, May 31. 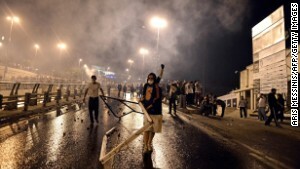 Demonstrators set up barricades and build a fire as they clash with Turkish officers on May 31. Friends carry an injured protester on May 31. 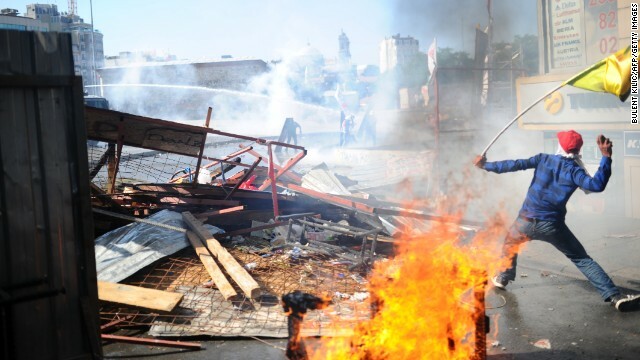 More than a dozen people have been injured in the clashes. 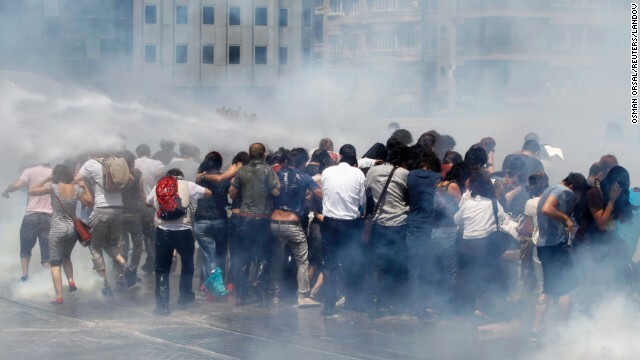 Riot police use tear gas and water cannons to disperse a crowd at Taksim Square on May 31. 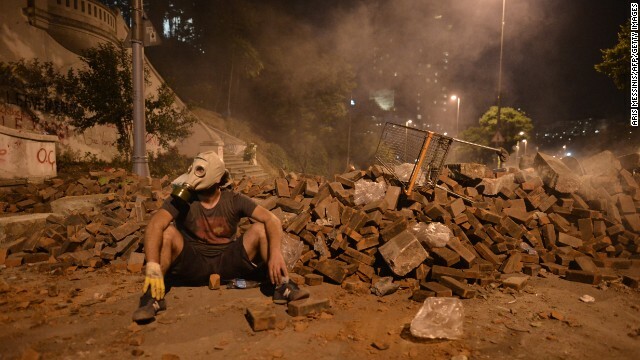 An activist wearing a gas mask is enveloped in a cloud of tear gas on May 31. 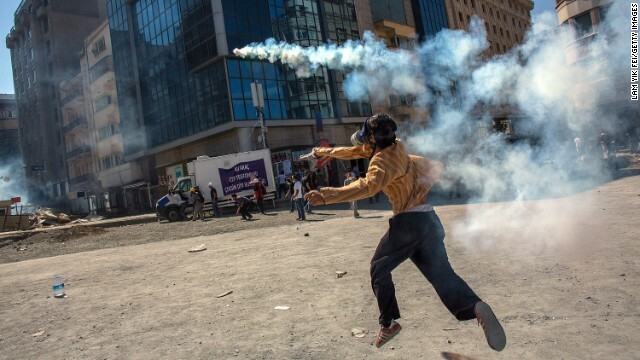 A crowd scatters during clashes on May 31, as one demonstrator throws back the tear gas canister that was launched by riot police. 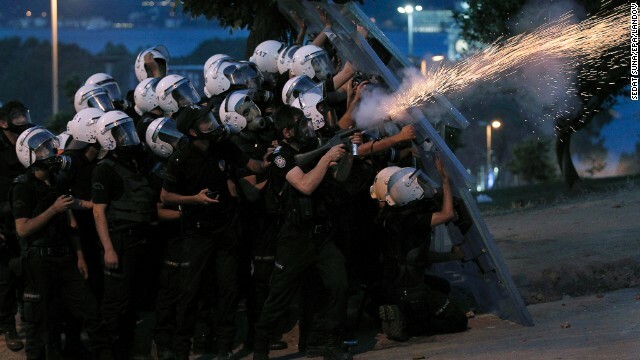 Protestors brace themselves as they are fired upon with a water canon by Turkish police forces. 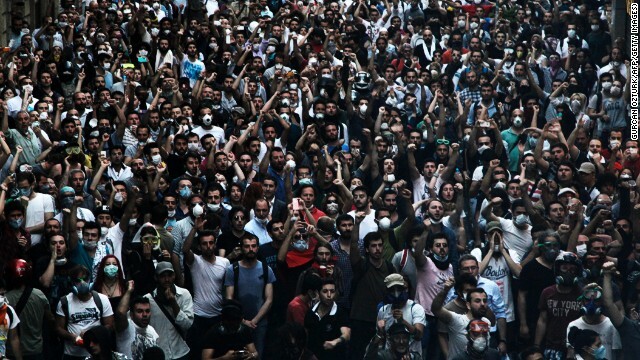 A large group of demonstrators gather to protest the demolition of Gezi Park in Taksim Square on May 31. A Turkish riot policeman uses tear gas in Taksim Square on May 28. In the 20th Century and earlier, the area was only partially inhabited, he said, housing a military barracks and military training ground and a cemetery running down the slopes and a military hospital that still remains. "In the 1930s the cemetery was moved to another part of town and the area was opened up for apartment buildings -- and at one point it was one of the 'poshest' parts of the city," he said. "Most of the apartment buildings face the Bosphorus [the strait that connects the Black Sea and the Sea of Marmara]," he said. "Because of its majestic view, [Taksim] is an attraction in its own right." It was estimated that millions of people went through the area to work every day, Kalaycioglu said. Since the protests, however, Taksim has been blocked to traffic. This impromptu pedestrianization inadvertently reflects the authorities' plan to divert all traffic from the square. Kalaycioglu said plans to take the traffic underground included a pedestrian curb but after the tunnel was dug it was discovered that not enough room had been allowed for foot traffic. That was when the government decided to slice off part of Taksim's Gezi Park -- one of the last green spaces in Istanbul's center -- "which the ecologists and architects of the city started to argue against." 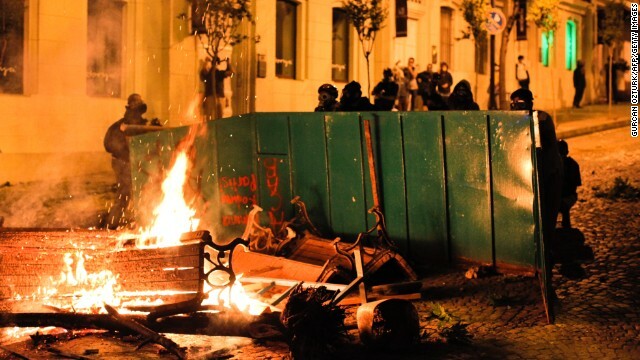 Read more: Is Gezi Park Turkey's Tahrir Square? 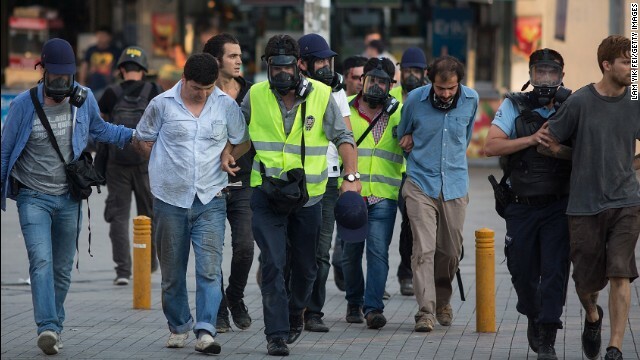 "When machines were sent in to take down the trees, the people who had been protesting there tried to stop them and a row intervened between the construction company and the protesters -- and police intervened," Kalaycioglu said. But in an interview with CNN's Christiane Amanpour, Mevlut Cavusoglu, the deputy chairman of Erdogan's AK Party said the project for Taksim Square had enjoyed cross-party support. "This project was actually supported by all the political parties in the city council and it was adapted unanimously at the city council," Cavusoglu said. He added that the number of trees in the square would be increased by the project -- with plans to replant 10 of those being removed from Gezi Park. Cavusoglu denied reports that a mall was part of the project. "The building of a shopping mall has never been considered here in Taksim Square. What is [being] considered is the pedestrian way and putting car traffic under the tunnel and enlarging Taksim Square," he said. "Only old military barracks is considered to rebuild. " The big issue there is, is of course freedom of expression and to be treated as stakeholders -- not as cockroaches. More is at stake than just Taksim Square. The plans to rebuild Ottoman-era barracks had raised two different issues -- the physical change and the idea behind it, said Benjamin Fortna, professor of Middle Eastern history at SOAS (School of Oriental and African Studies), University of London. "The idea -- building a replica of a past building - probably suggests to some people that the government's trying to link itself to the Ottoman past. But of course the square does exist from the Ottoman period." Fortna said many people objected to a "kind of glorification" of the Ottoman era, which the early republic had tried to "ignore and denigrate." The term "secular" -- most often understood in the West as referring to the separation of religion and government -- was often applied to Turkey, Fortna said. "But in Turkey itself they use the French term 'laïque.' In Turkey you really have the situation that's related to the founding of the republic - that the state will kind of control religion," Fortna said. "So, for example, the Directorate of Religious Affairs is responsible for deciding the text that Muslim clerics can deliver in their Friday sermons. " Who is supporting Turkey's leader? Fortna said Taksim had long being a contested space and plans to change it would always be likely to cause controversy. "Because it's such a central location and because of its particular make-up and associations -- whatever happens there will probably be heavily scrutinized and criticized," he said. 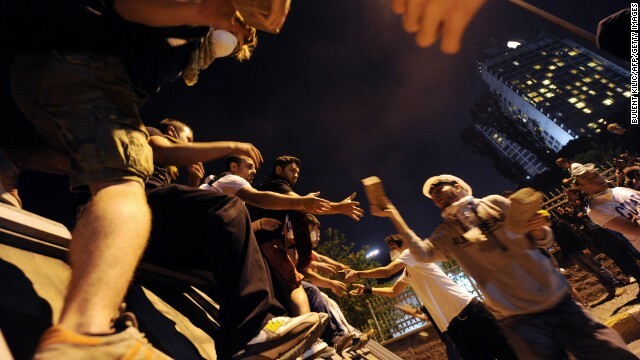 "Taksim is a place where demonstrators habitually gather. There's always a May Day protest for example. It's a place where people would naturally gravitate -- it's one of the few places where there's a fairly large open space in the city," he said. The current demonstrators have demanded Erdogan's resignation, accusing his government of creeping authoritarianism, while the prime minister has said the protests are part of an attempt by opponents who lost to his AK Party to beat it "by other means." 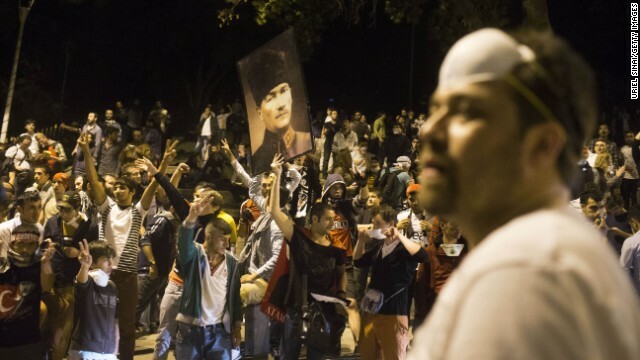 "The issue of trees in Gezi Park thing is just the trigger," he said on Monday. Kalaycioglu said the number of protesters had surged after evidence emerged of a brutal police response to the initial Taksim demonstration. He said the government had "started to argue that it was just a group of marauders" but that a huge majority seemed to be ordinary citizens, from all ages and walks of life and the government had eventually realized this and pulled the police out of the scene. In his interview with Amanpour, Cavusoglu -- Erdogan's deputy -- acknowledged that police had been heavy-handed and said their actions would be investigated but insisted that the government represented the Turkish people. "At each election the people have been increasing their support for our government and our prime minister," he said. "We are the democratic government and democratically elected parliament." But Kalaycioglu said the protests had spread spontaneously through Turkey, "motivated by the same theme." The government was "jumping on freedom of expression and freedom of the press," he said. "The big issue there is, is of course freedom of expression and to be treated as stakeholders -- not as cockroaches. 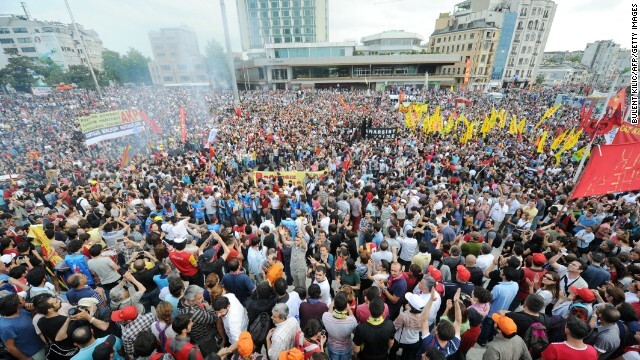 More is at stake than just Taksim Square." 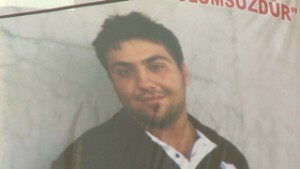 CNN received more than 1,000 iReports from Turkey in less than a week from Turks compelled to document, protest and demand their voices be heard. Did you witness the protests? Send us your images and video but stay safe. Scenes of violent clashes between protesters and police may make visitors to Istanbul think twice. Is it time to cancel your trip? The ruling party has exploited the resentment toward the parting with old Islamic ways when Ataturk moderned Turkey, writes David Perry. 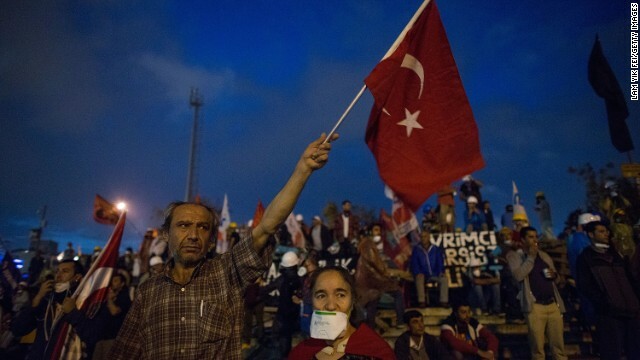 Why has Taksim Square become the flashpoint for protests across Turkey? The image of a woman in a red dress being sprayed with tear gas has become the symbol of the protests. He's perhaps the most powerful and popular politician Turkey has seen in generations. But Erdogan may also be the most polarizing. Violence in Turkey is a direct result of Prime Minister Recep Tayyip Erdogan's use of extreme force, escalating rhetoric, and inability to listen to dissent, two experts write. 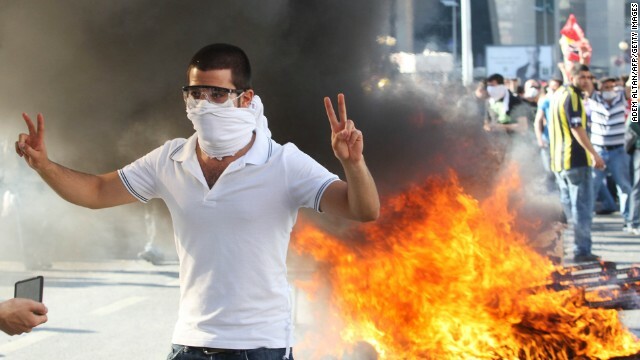 What's driving unrest in Turkey? How has a peaceful sit-in over plans to demolish a park grown to become the biggest protest movement against Prime Minister Erdogan? Browse through photos of the violent protests sweeping across Turkey.